Okay, I admit it. This is me checking out how you post photos on Samizdata, with Michael Jennings sitting next to me to show me, what with him already having done this successfully. Words don’t fail me, but you surely know what I mean. There’s the fact that Concorde was scrapped in 2003. There’s the weird colour changes imposed upon the dear old Union Jack (which were such a feature of life in London in this Olympic Year). 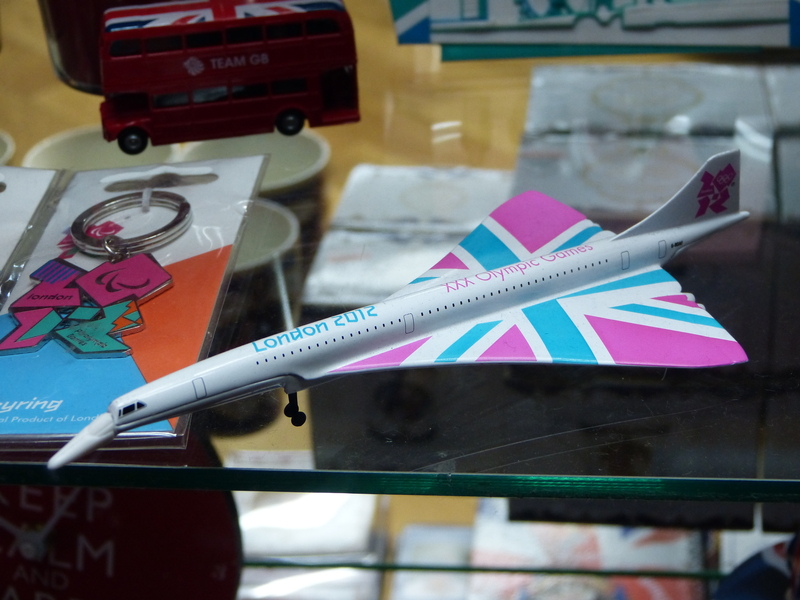 There’s the fact that this is an item of weirdly designed Olympic stuff on sale and on display in a London shop (it was not the only one – trust me). And there is the fact that this weirdly designed Olympic object is still on sale now, months after the Olympics have been and gone. Michael assures me that Olympic crap will still be around in our shops for many more months yet. There is probably plenty more to be said about this strange, strange thing, but I leave it to others to add such observations. Mmm. I’d like to think it’s connected with being rather more proud of a radical, iconic and staggeringly beautiful piece of British engineering ingenuity, than a mere sporting event. Expect any nation with space launch capability which is daft enough to agree to host the Olympics in future, to have Olympic-branded rockets among their souvenir tat. I have the same die-cast model, with the same appalling plastic droopy-nose, as a Christmas gift from the early 1980s; as such I have half a suspicion that there is a warehouse of them somewhere, looking for excuses to be sold. Yep, I bet Delboy’s lock up is full of them. I had the privilege of seeing the last British one flying, landing for the last time at Filton, from my bedroom window. Firstly, of course, it was an Anglo-French design. Hence the name. A living monumeent to the fatuous idea that you can ever make the Brits and the french cooperate on anything. If that example is not clear enough, then see EEC. Secondly, your description is one way of looking at it. Another way of looking at Concorde is that it embodies one of the core principles of aeronautical engineering, namely, that with enough thrust, you can make anything fly. Thirdly – vastly over-budget, amusingly under-spec, a sales fiasco and requiring a figurative fire-hose of government subsidies to transport tiny numbers of passengers in relative discomfort, Concorde repeated the hard lesson that should have been learned with R101, but wasn’t – state development of aircraft always ends in disaster of one sort or another. R101 was en engineering marvel too, but it was a failure, just the same. Beauty is in the eye of the beholder. My first wife was quite easy on the eye, but I’d be lying if I told you that the failures of our marriage didn’t dim her pulchritude considerably. When I look at Concorde, I feel the same way – a passing attractiveness of form, and some fascinating engineering, doesn’t compensate for its complete failure, as measured by every other possible metric of success. Whereas the Stretched DC-9, for example, was the very epitome of aeronautical beauty and grace. *Sigh* … so beautiful … even on the tarmac. And seen in her proper environment, aloft — magical. I have always thought that the Concorde, rather than being a vision of the future, looked very old fashioned. It was a 1950s idea of the future built with at best early 1960s technology, and this showed. Whereas the Stretched DC-9, for example, was the very epitome of aeronautical beauty and grace. Was? If you consider all the variants of the DC-9 (the later ones not always being called DC-9, but still obviously being variants of it) there are probably close to 1000 of them still in service in various places around the world. As well as looking great, the DC-9 was and is a great, reliable workhorse that was produced in huge numbers and has made lots of money for its operators. None of that can be said for the Concorde. On this occasion, I have no idea what you are referring to Julie n C. I didn’t blow the bloody tires off, the French did. Michael Jennings has it about right with the 50s design and 60s tech line. Fast yes, but incredibly cramped for passengers. I have been on one, no not to fly, just to look around, and frankly however much bubbly and caviare you served me, I’d still be sitting for hours with my knees up under my chin. It was the first and only successful supersonic commercial airliner however, and the Americans and Russians were working on their own versions. And I can’t help feeling that if America had breasted the tape first, there would have been no bans and flight restrictions due to the noise and sound barrier being broken, which pretty much did the Concorde in as a comercially viable plane, except for the very rich, and on very limited routes. RAB, No left-turns intended. It’s just that as I read your opening remark about watching the takeoff from Filton from your bedroom window, naturally I added a balcony to your 2nd-floor bedroom window and barbed wire around the airfield, and there was the scene from The Fourth Protocol, smack-dab in front of me. In any case, no, nobody was French–not even the aircraft. You were either the English Good Guy Spy (Michael Caine) or some version of an Eastern Bloc agent (Pierce Brosnan!?!). *Not up to Quiller’s standard, of course. ‘It was the first and only successful supersonic commercial airliner’ . . .
First, yes, Successful? Well, yes, for a given value of ‘successful’. See above. It did fly quite well – I guess that is one level of ‘success’. Nonsense. Anglo-centric fantasy – a common ailment. The US SST program was already facing significant environmental opposition in the mid-to-late-60’s – long before Concorde even flew – and the program was completely de-funded by the Congress in 1971, five years before Concorde carried its first ‘paying’ passenger. It’s just fantasy to suggest that international concerns about noise and pollution would have been any different if the US SST program had continued. In some ways, the US should be grateful that the Concorde showed them early just what an awful idea this was.
. . . except for all the major engine systems which allowed the plane to fly at all, large parts of the fuselage design and a mass of subsystems and avionics content. All of the major first tests (and the first flight) were completed in France. Probably because the UK partner was in such a continual state of stereotypically-British business and political chaos for the first 10 years of the project’s life. Look, it’s Bristol, and Bristol-Siddeley, but all of a sudden, it’s BAC and Roll-Royce, and this government supports it, but now this government doesn’t, and so on, and so forth. Concorde was a gigantic white elephant, a political and nationalistic dreamboat that was an obvious commercial failure before it carried its first passenger. No matter how thick the lipstick, it was still a pig. Heh! I knew I would be clobbered by someone for that comment, that’s why I did it. “Nonsense. Anglo-centric fantasy”. We like our Anglo-centric fantasies thank you so much, and besides not so much of a fantasy either. The engines were Rolls Royce fer chrissakes! based on those on the Avro Vulcan; not much French imput there. The two prototypes, one French and one British flew within one month of each other, hardly a huge gap eh? But yes the shilly-shallying of the Wilson Labour Govt did the project no favours. But yes, I admit, it was a white elephant, but a beautiful thing to see in the air.